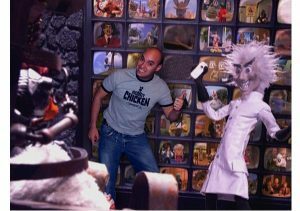 In 2007 I worked in the set department of [adult swim]’s “Robot Chicken” building miniature sets and props for the show at Shadow Machine. I built and painted anything from books & pipes, to cars & tombstones, tanks and much more. Below are the things I built, some are easy to spot some are not.